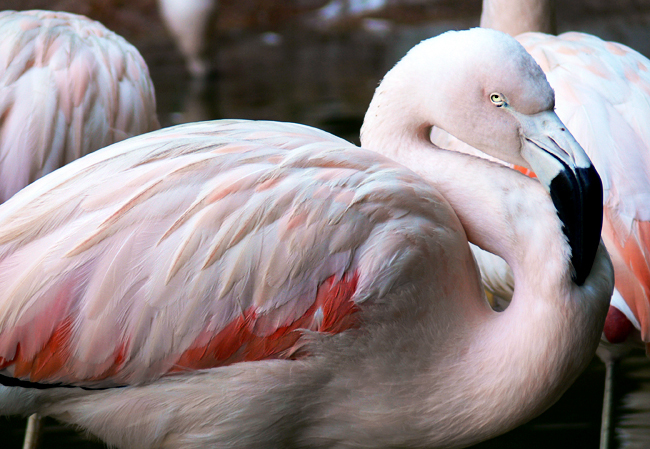 Did you know that there are only five or six species (depends on source) of Flamingos in the world? The flock at Zoo Atlanta are Chilean Flamingos and this beautiful flock are the welcoming committee—at "Flamingo Plaza"—just inside the entrance to Zoo Atlanta. Having been born in Florida, Flamingos have long been a fun fascination for me. I'm sure at one point, we even had the plastic sort in our yard—you don't get much more Florida than that! But, the Flamingo has held much more prestigious roles throughout history, including the earthly incarnation of the Egyptian god Ra; their fat was once thought to cure tuberculosis; and today they're the national bird of The Bahamas. I've never seen a flock of flying Flamingos, but have read that they can number into the thousands...can you imagine what that must look like?! As beautiful a sight as that must be, I think it'd give too many of us Atlantans Hitchcock flashbacks. Still...I'd love to see a flying flock. Check out Zoo Atlanta, and remember, if you're on a budget, AtlanTix—Atlanta's same-day-half-off ticket office—often has discount tickets to attractions like the Zoo. Now go have a wild time and enjoy Zoo Atlanta!